We started off our 1602 Dundas bourbon trio evening with a small batch Kentucky straight bourbon with handmade sour mash and mysterious origins – Black Maple Hill. Most enjoyable, very drinkable… spunky character… it reminded me of Elijah Craig – in a good way. I will admit I tasted just a small sample with a friend knowing nothing about the bourbon. I’ll admit again – I’m not really a bourbon drinker, but this certainly was more to my taste than most. What was amusing is when I dug a little deeper to find out more about Black Maple Hill… guess what… it seems the one we had may possibly have elements from the same folks behind Elijah Craig… whaddya know! Or is it?? The story isn’t so simple… it was once said to mostly come from the Stizel-Weller distillery and bottled by Julian van Winkle – an insiders secret with quality rare bourbons aged from 11 – 22 years… It then was labelled as aged for 8 years and garnered spill-over hype from the elusive over-priced Pappy… selling for thousands of dollars! The dark rust label no longer claims an age and while Heaven Hill is credited on sites such as The Whisky Exchange, you won’t find Heaven Hill claiming it as one of its American whiskey brands. Throw into the mix Willett Distillery – which for the most part does not distill its own spirits and has even been known to put out products under fictitious companies… And others from Kentucky Bourbon Distillers (KBD) and you have a mystery blend from various unknown sources. 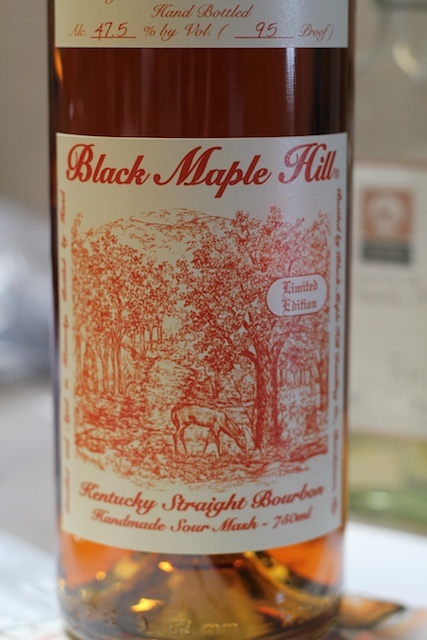 Then the new Stein Distillery from Oregon came into picture… leading to a new spin-off Black Maple Hill from Oregon. Alas my photo from our evening is madingly blurry and indistinct, however it was labelled as Kentucky straight bourbon and given the flavour profile of what we sampled, I’m guessing it shares some of the same bourbon source as Elijah Craig. So here it is – the story of Black Maple Hill. A Bourbon made somewhere in Kentucky, sold to KBD, blended at their facility, sold to Paul Joseph, slapped with a romantic label, and distributed down the street from K&L in Redwood City. All that matters? Of the trio we tasted that evening, this was my choice! Other forays into American whiskies…. 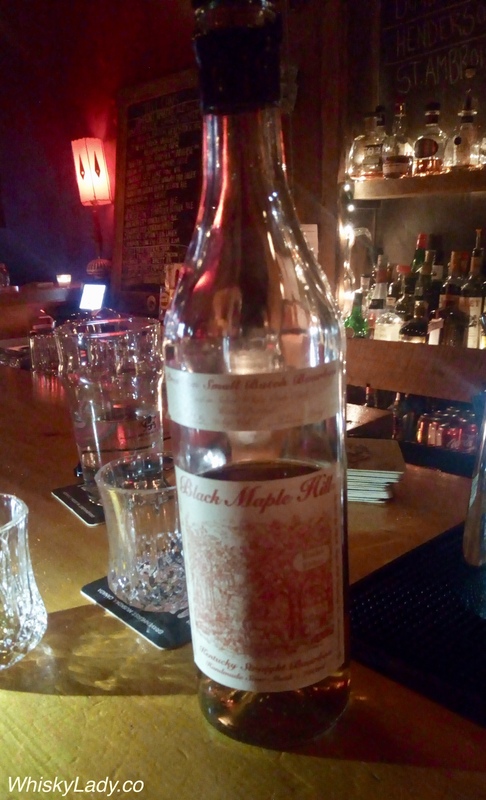 This entry was posted in American, Beyond Scotland and tagged Black Maple Hill, Blend, Bourbon, Kentucky Straight Bourbon, Mystery malt by Carissa Hickling. Bookmark the permalink.